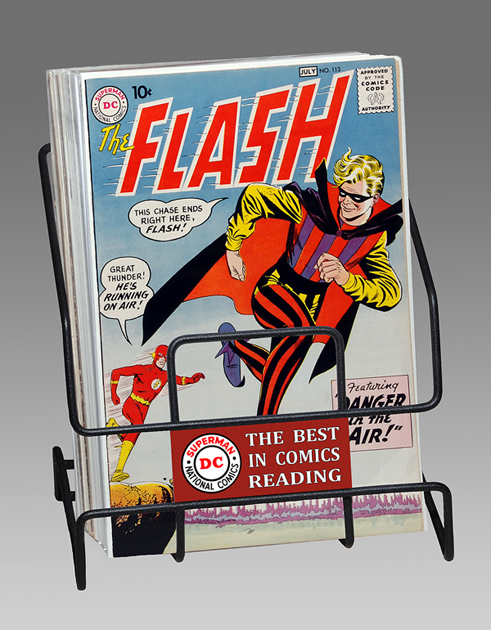 DisplayEm Wire Presentation Rack - With a 7.75" width slot that allows for bagged/boarded comics and standard size Pulp display. Each rack is available in it's original color of Powder Black and holds 24 or more comics and 6 to 10 pulps depending upon thickness. Each Rack comes with 1 Panel Board of your choice. Custom Boards are available upon request, but may cost extra. 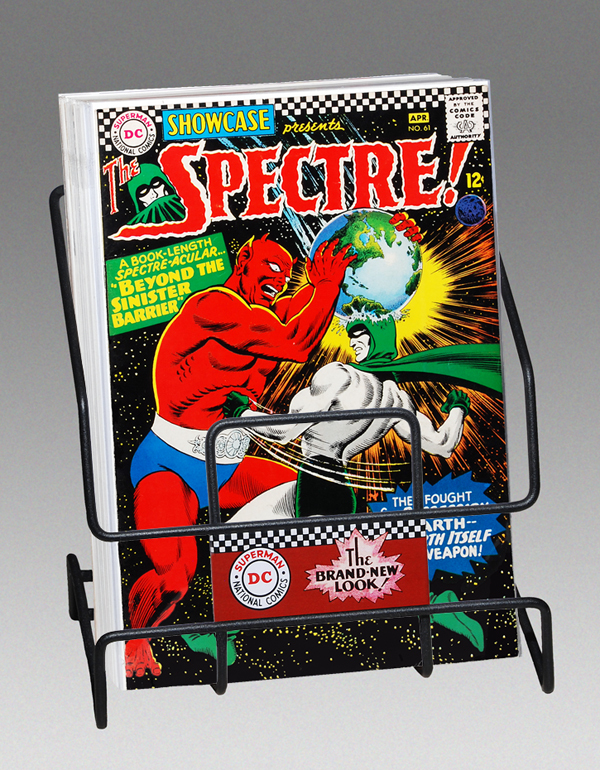 NO COMICS/PULPS ARE SUPPLIED WITH THE RACK. Wire Racks have been used for displays since the late 1920's. 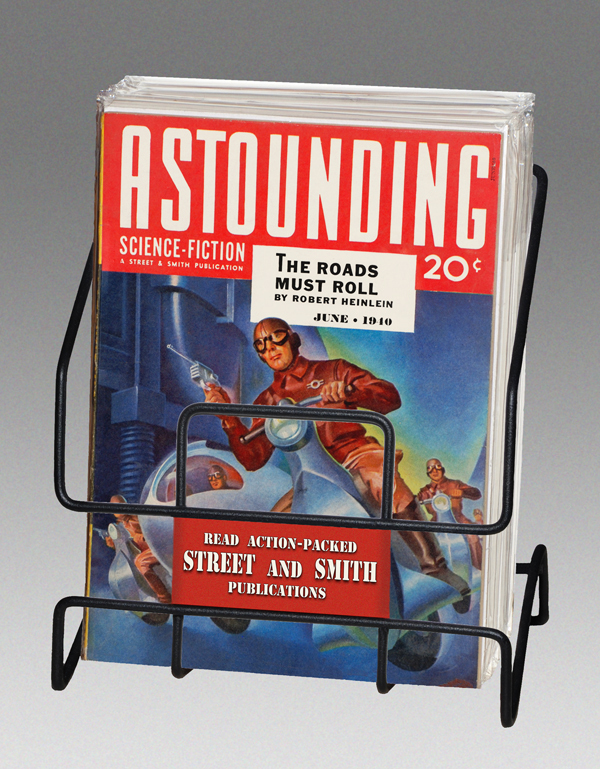 This type of countertop display was designed in 1936/37 and became widely popular from the late 1930's thru the early 1960's to display comic books, pulp magazines on sales countertops throughout the US and Canada. This display allowed for the attachment of advertising to promote the type of items being sold (i.e. Comic Books from various publishers, Hero, Horror, Science Fiction, Western and Detective Pulps). 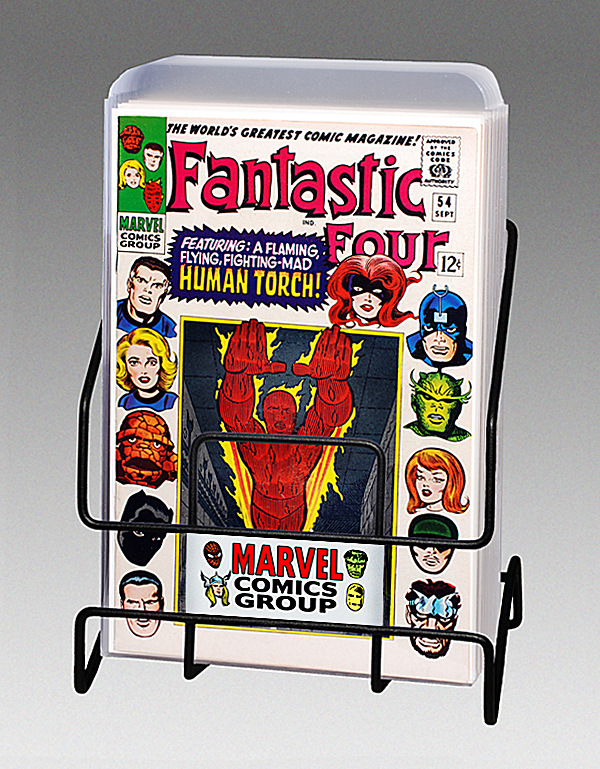 Now you can own a reproduction of this point of sale display rack to showcase your collectibles in your home or office. An ideal conversation piece and much less costly than buying a very rare original countertop rack which can cost $400.00 or more when they can be found. These are available currently in two sizes. One to hold Gold, Silver and Modern Age Comics and/or pulps and another to hold CGC/PGX graded and protected comics, 8.5X11 size pulps or standard-size magazines. Each rack will also hold various size hardcover books. The design has no rough or sharp edges that can damage your books and has a backward slant 10 degree angle to keep items in place and from pressing against the front of the rack.